Sri periyachi is considered as the protector of children and mothers. Newly born babies are placed at her feet to receive blessings for a healthy and a long life. The periyachi Pooja is conducted annually in the temple in a grand manner and is attended by many devotees. 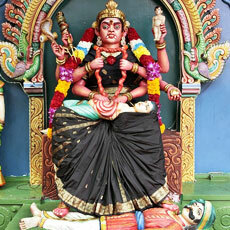 Sri Periyachi has an interesting legend associated with her. A demon king once performed a major penance to attain the blessings of Lord Siva. The lord, pleased with his penance offered a boon, at the request of the demon, a son which could perform the three duties of creation, preservation and destruction. As such, the demon king's wife became pregnant. This development worried the consorts of Brahma (Lord of Creation), Vishnu (Lord of Preservation) and Shiva (Lord of Destruction). They decided to destroy the child. When It came time for the demon queen to give birth she suffered from great pains. The best midwives in the country could not relieve her from her pains. A mid-wife, who claimed to be new to the country, said she could save the queen. She was immediately tasked to do so. The new midwife placed the queen on her lap and tore her new stomach apart. Seeing this, the demon king sprang forth to her her but was crushed under her legs of the midwife. The midwife is Periyachi. The legend was meant to reflect that nature should take its course and crucial actions like creation, preservation and destruction should be performed by the supreme beings and not changed hands. This will bring about catastrophic conditions. To this day pregnant women seek the blessings of Sri Periyachi to have a complication in Child Birth. Periyachi is popular in the South East Asia region because most of the Indians especially the early settlers from South India.